The mission of The Morton Arboretum is to collect and study trees, shrubs, and other plants from around the world, to display them across naturally beautiful landscapes for people to study and enjoy, and to learn how to grow them in ways that enhance our environment. Our goal is to encourage the planting and conservation of trees and other plants for a greener, healthier, and more beautiful world. 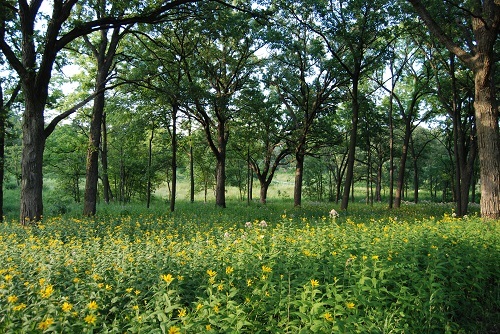 The Morton Arboretum is the site of numerous restoration projects. This includes the restoration of a 40 hectare tallgrass prairie and savanna which is one of the oldest tallgrass restoration projects in the United States. 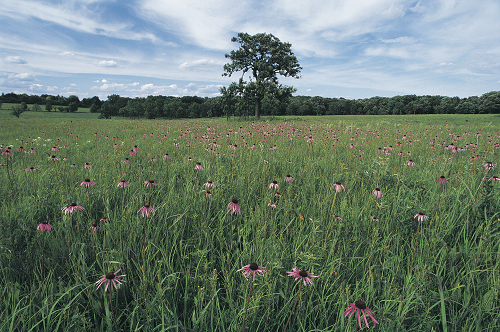 The Schulenberg Prairie and Savanna was established in 1962 and has developed over the decades to include over 500 plant species, including the introduction of 9 endangered species. The propagule sources for this restoration all came from within 80 kilometres of the restoration site, many of which have been subsequently demolished due to development and urban sprawl. The high species richness of this restoration also ranks similarly to local prairie remnants, a feat which is incredibly difficult to attain in tallgrass prairie restorations. The Morton Arboretum is also restoring 280 hectares of oak woodland, known as East Woods, which contains an old second growth oak (Quercus alba, Q. rubra, Q. ellipsoidalis, Q. macrocarpa) canopy with a greater sapling layer presence of mixed mesophytic species. This restoration includes experimental methods of prescribed fire and canopy thinning to recruit oak seedlings, which are largely absent from the woodland. Current management activities have yielded significant increases in species richness, including two locally threatened plant species. Finally, overall habitat heterogeneity throughout the Arboretum’s natural areas has recently fostered more ecological restoration projects within wetlands and along 6 kilometres of streams. More details about current restoration projects at Morton Arboretum please contact Kurt Dreisilker or click here. Schulenberg Prairie at the Morton Arboretum, one of the oldest restored prairies in the Midwest United States, was established in 1962.